With my turn coming up to host “Coffee Break Mondays,” I was under a lot of pressure to be able to brew a gourmet cup of joe! What better ingredient, than homemade whip cream? It’s not an original idea, but a classic treat! Product was received for review purposes and this post may contain affiliate links. Thanks to my new friends at Creamrite, I am now able to put a fantastic topping on my coffee! There are also countless other uses for this great little appliance, but HOLY COW does it make any coffee DELICIOUS! Its very easy to use and clean. It comes with different styles of tips for different decorating effects. You can find tons of great recipes on their blog as well! I was shocked to see how many uses there are for this whip cream maker! From mousse to mustard, this thing is going to come in handy! You put the ingredients into the dispenser, close tightly, shake, attach the N2O charger, remove it, shake again, and that’s it! Use the desired top, spray while holding the unit inverted and enjoy! The products they carry. I didn’t know they had so many and also the recipes. I <3 whipped cream, especially the kind you get on your frapp. The Whipped Cream dispensers are nice and would not only save me money, but would make me a happy camper. The variety of products caught my eye. the soda syphans look pretty cool. 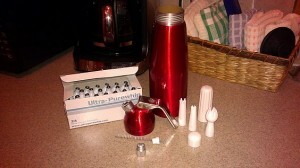 Love the Red Whipped Cream dispenser. The Soda Siphons might be fun. Anything that has whipped cream in it catches my eye! The red half pint whip cream maker catches my eye. The Classic Glass Soda Siphon caught my eye. I like the iSi stanless steel funnel and filter for whipper. 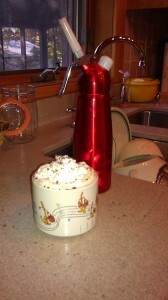 I like the iSi Half Pint Easy Whip Push Button Whip Cream Maker. I also like the Classic Glass Mesh Soda Siphon!